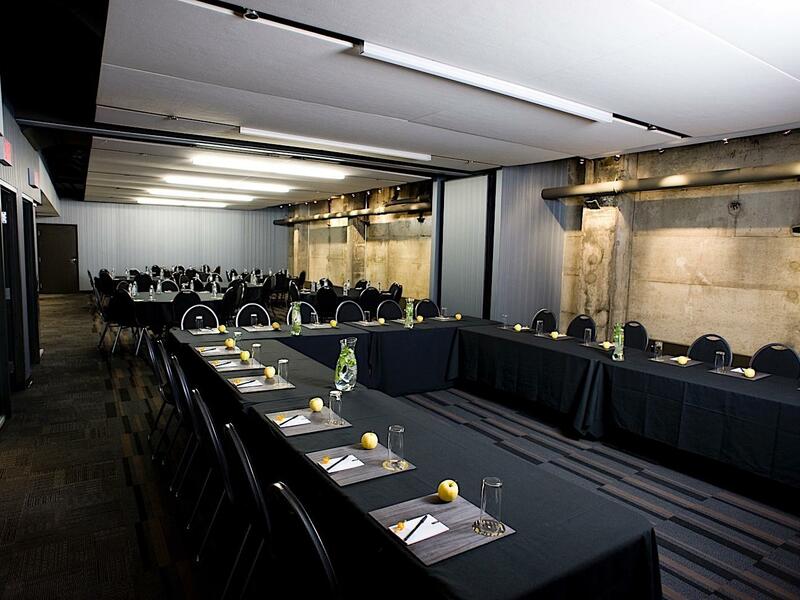 With a great location near the downtown business district, our modern hotel is a perfect venue for corporate events, business presentations, and celebrations. Hotel ZERO1’s friendly staff is dedicated to the pursuit of perfection, ensuring that your gathering will be one to remember. Catering service is also offered through our restaurant, the Z Tapas lounge. Our property boasts 3,500 square feet of unique event spaces, each featuring slick urban décor and state-of-the-art technology. Whether you’re planning an 8-person board meeting or a holiday cocktail party for 130 employees, you won’t find a more distinctive venue than Hotel ZERO1. 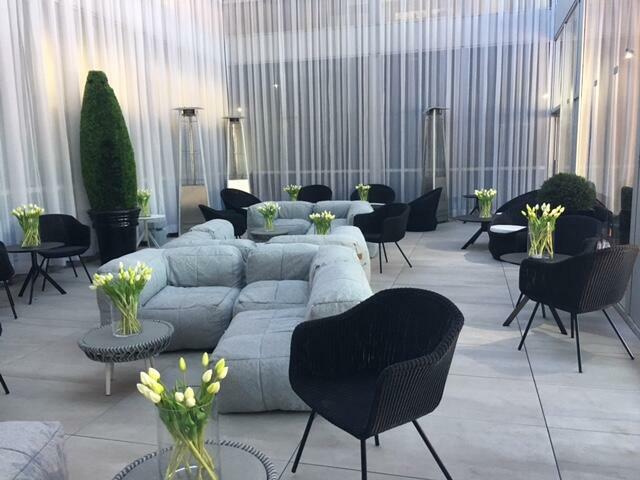 We also offer a bright interior courtyard and a scenic terrace for warm weather events. 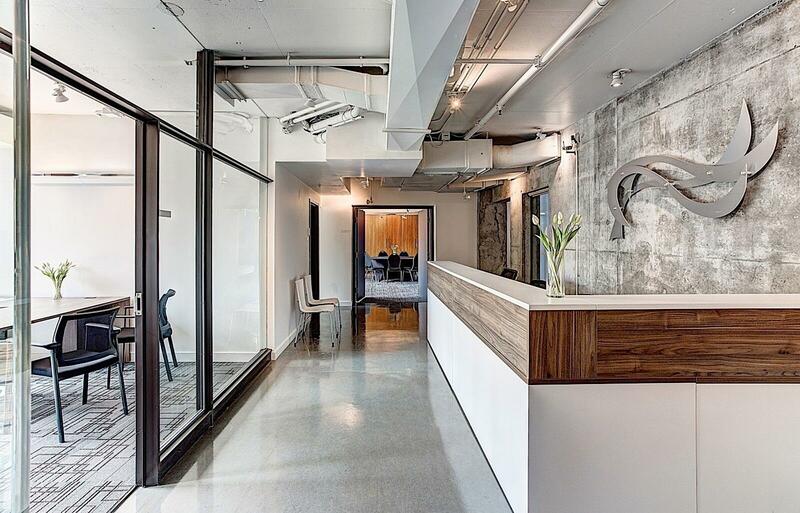 Learn about our corporate advantages and preferred rates for business clients by calling our Sales Manager, Marie-Sophie Pons, at (514) 871-9696 ext. 205, by email at [email protected]. 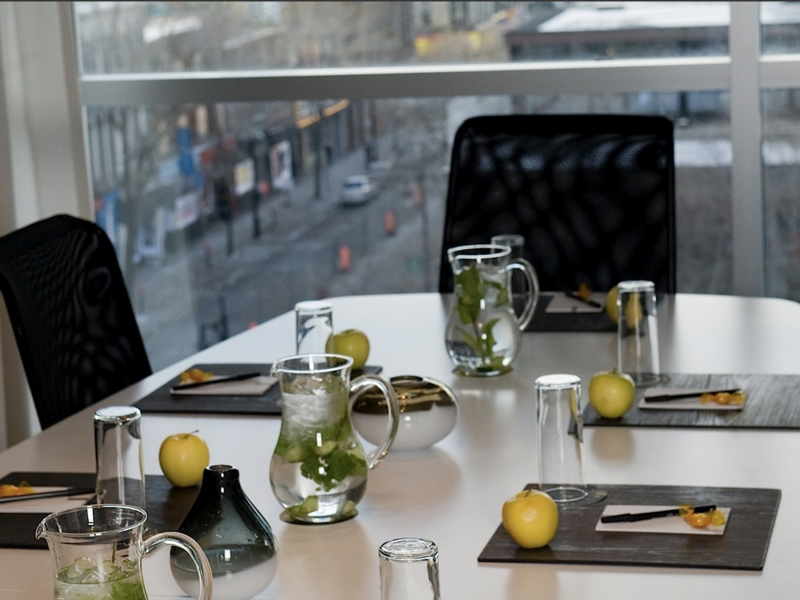 Hold your meeting surrounded by inspiring city views in one of our Panoramic Meeting Rooms. 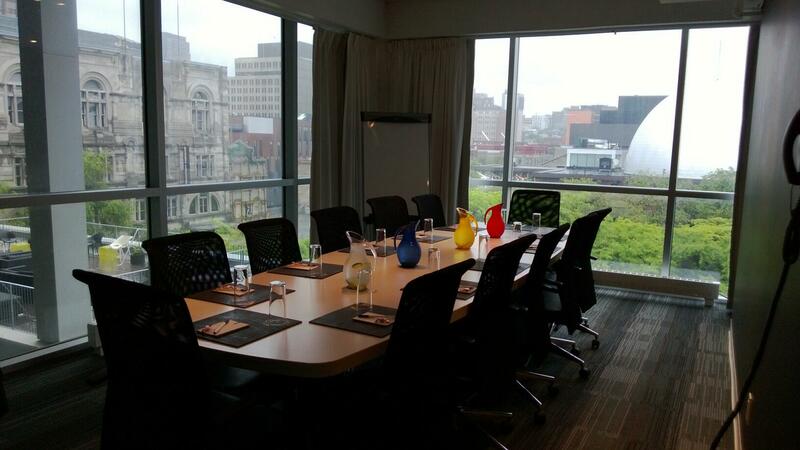 Located on the 4th, 6th and 7th floors, our six meeting rooms offer floor-to-ceiling windows with spectacular views of downtown Montréal. Every room includes free Wi-Fi, a 32-inch flat-screen TV and HDMI cables. 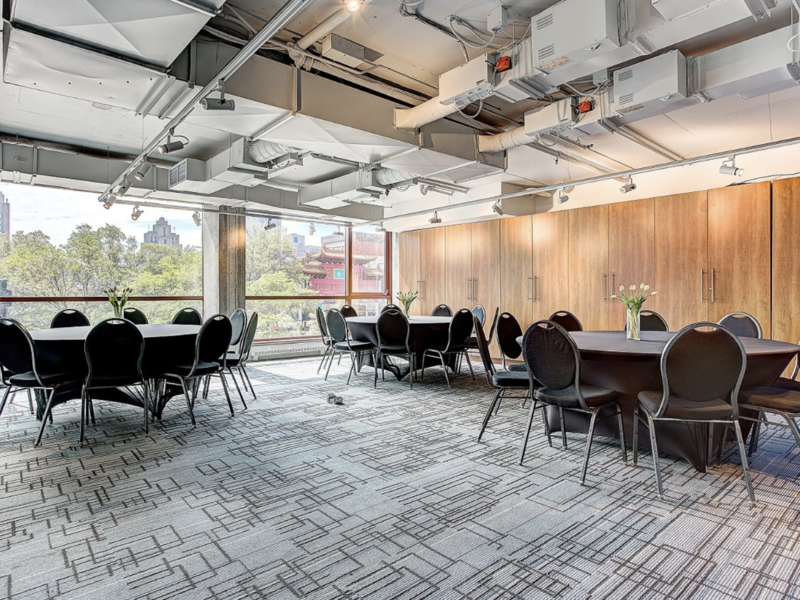 With space for up to 14 guests in a conference setting, our Panoramic Meeting Rooms can easily accommodate breakout sessions, small cocktail reception and intimate meetings overlooking the city. View our meeting brochure or capacity chart to learn more. Our sleek Workshop Z is located on the ground floor of the hotel and is a perfect option for productive business meetings and memorable celebrations. 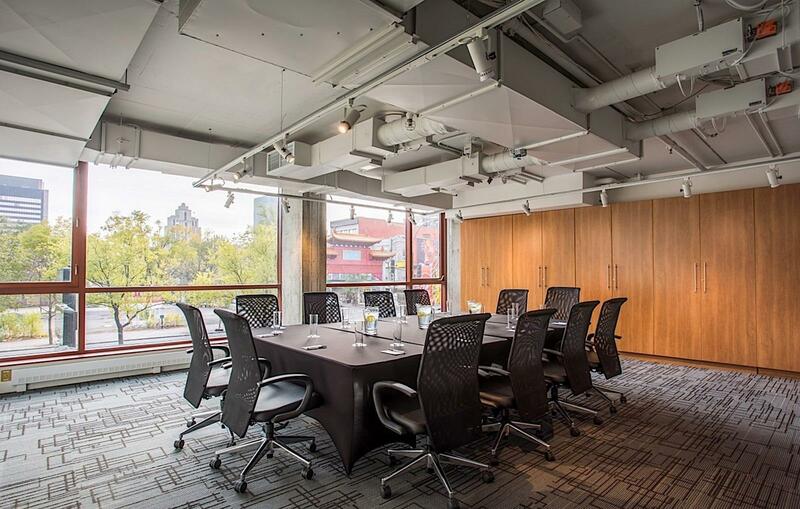 With space for up to 16 people boardroom-style, Workshop Z features complimentary Wi-Fi, a 48-inch flat-screen TV and HDMI cables. Host your next dinner banquet or annual congress in our spacious Alys-Robi Hall. 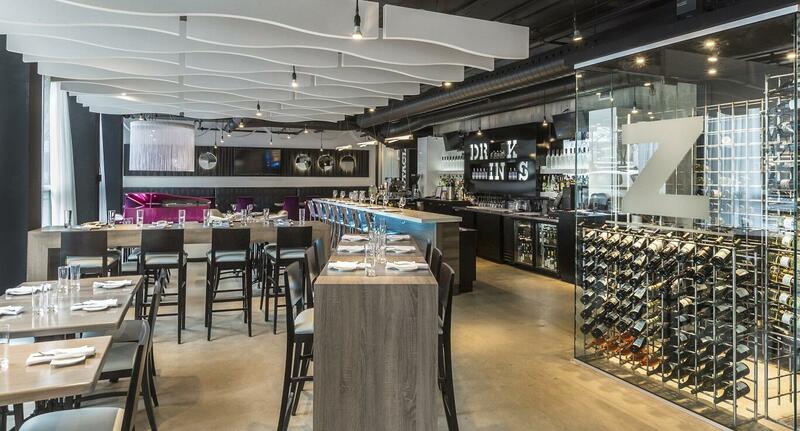 With room for up to 120 guests, this urban-chic venue is a one-of-a-kind setting in downtown Montréal. The hall can be divided into two sections and comes equipped with complimentary Wi-Fi and a big-screen TV for seamless presentations. The Z Confidential meeting room is located on the 2nd floor of the hotel and is a very bright space for your meetings or social event. With space for up to 40 people boardroom-style, Z Confidentiel meeting room features complimentary Wi-Fi, a 50-inch flat-screen TV and HDMI cables. The Atrium of Hotel ZERO1 is our private outdoor courtyard. This beautiful open space is located in the center of the lobby and is surrounded by windows. 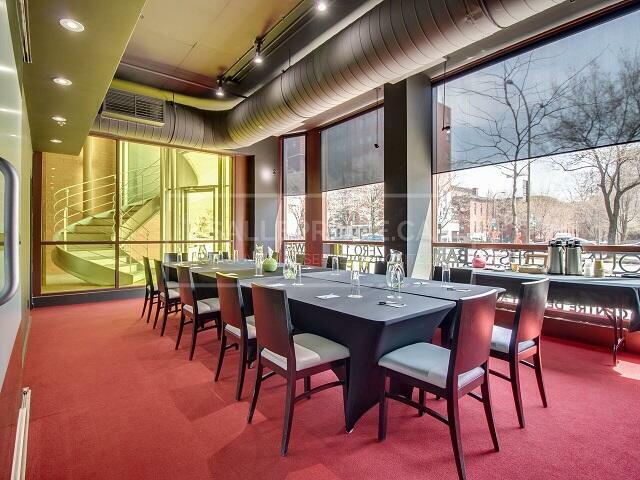 The Atrium can be rented from MAY through SEPTEMBER for a corporate or social private event. Please contact Geneviève at [email protected] for more information or to reserve our Atrium. Our stylish restaurant, Z Tapas Lounge, serves inventive tapas dishes for dinner. The restaurant is located next to the lobby and is open from twelve noon until 10pm for private events or groups reservations. Contact us to start planning your event at Hotel ZERO1 today. Or if you want to find out about our corporate advantages. Would you like to sign up to receive future specials information? Your message has not been sent, please ensure that all required field are filled out.